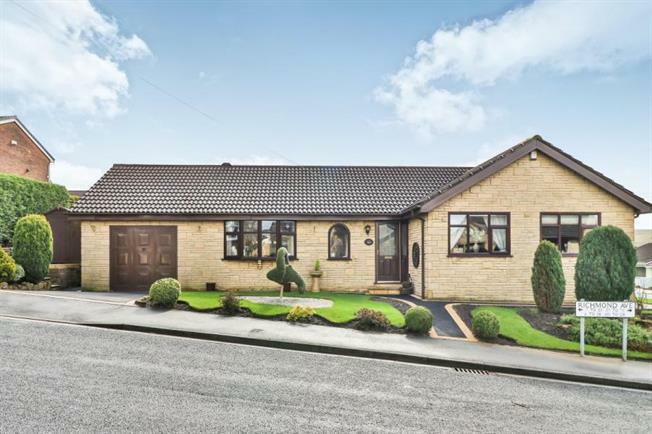 3 Bedroom Detached Bungalow For Sale in Burnley for £290,000. Individually designed Detached TRUE bungalow in sought after CLIVIGER! A superbly presented 3 double bedroom detached bungalow ideal for buyers looking to live on one level but affording generous sized accommodation throughout. Having been maintained and vastly improved by the current owner this is an ideal home for buyers either down sizing from a larger property and for families. Located in this enviable position within the village of Cliviger this property is ideally located for both the countryside and Burnley town centre for its wide range of facilities along with being within a short walk of Towneley Park. The property comprises of a spacious lounge with Karndean flooring, newly fitted quality kitchen with integrated appliances opening to dining area, master bedroom with fitted wardrobes and en suite shower room, 2 further double bedrooms with fitted wardrobes, large family bathroom with modern suite, replaced upvc TRIPLE GLAZED windows, utility room, gas central heating, very large loft ideal for storage, attached garage with additional of road parking for 2 cars, large gardens surrounding the property with enclosed gardens to the side. Viewing is highly advised! Newly fitted Karndean flooring, radiator, dado rail, built tin cloaks cupboard with shelving, further built in cupboard, access to loft with retractable ladder. Sink unit with mixer, plumbing for washing machine, space for tumble dryer, space for dishwasher, sink unit, tiled floor, cupboard housing gas central heating boiler, upvc triple glazed window to rear, door leading to exterior and personal door leading to garage. Upvc triple glazed window to front, range of fitted wardrobes with over head storage and matching bedside cabinets and dressing table, concealed lighting, double radiator. Comprising of a large walk in tiled shower with Mira electric shower unit, pedestal wash hand basin, low level wc, part tiled walls, upvc frosted triple glazed window to side. Upvc triple glazed window to side with views, range of fitted wardrobes, radiator. Upvc triple glazed window to front, laminated flooring, range of fitted wardrobes, radiator. Fully tiled walls and floor, 4 piece suite comprising of corner bath with chrome Victorian style mixer, pedestal wash hand basin, low level wc, bidet, chrome towel radiator. There are well tended garden to the front and to both sides of the property, newly laid tarmacadam pathway, neat lawn, borders with a range of flowers and shrubs. The main garden is located to the right and hand side of the property and is screened by conifer trees for privacy, lawn, outside lighting, timber storage shed. With up and over door, power and light, workshop area, additional double driveway with parking for 2 cars.